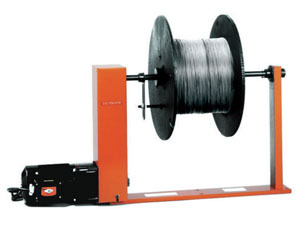 The DE600M motorized reeler/dereeler easily reels wire or cable without operator fatigue, or quickly dereels large amounts of wires or cables with no pulling. The 1/6 HP motor turns the shaft at a constant speed of 57-1/2 RPM and can handle reels of material up to 75 lbs. (34 Kg). Reels are easily loaded. Also included is a handle to enable manual reeling and dereeling if desired.